Hi, I am considering that could you update this topic by sending Temp and Hum data to Cloud instead of display them through web server? Thank you! Which project are you referring to? Can you post the full project name? Are you using Arduino IDE or MicroPython? Which cloud service would you like to have it integrated with? I am working on IoT Lab Prototype project. The purpose of this project is for demonstrating viability of an IoT lab. My solution is using DHT22 for collecting Temp and Hum, ESP32 for processing unit, adafruit cloud service for storing and analyzing data, also MQTT and Node-Red to display and interact with the prototype. I am considering using a fan or a LED in term of user interacting with the prototype. And some line of code in main as well. Hello, unfortunately I don’t have any tutorials about posting data to the Adafruit service, but on their blog they have many code examples about their platform. I recommend using their examples. Hi Rui, I am using MicroPython. Do you have any tutorial on “MQTT – Connect ESP32/ESP8266 to Node-RED” using DHT11/22. In your book you use Ds18x20 sensor but it just publish only 1 data temperature. I am using DHT22 so I get stuck on how to publish both temperature and humidity to MQTT broker. And also how can I install Mosquitto Broker on ESP32? Thank you! Unfortunately I don’t have any tutorials on that exact subject (publishing DHT readings via MQTT). However, if you read the Unit “Web Server – Display Temperature and Humidity Readings”, you can learn how to read the DHT sensor with the ESP32. Then, you can read this topic that has extra information on how to send multiple readings: https://rntlab.com/question/python-esp32-course-chapter-node-red-how-does-one-add-an-additional-temp-sensor-ds18b20/ . In summary, you need to create two topics and have two statements to publish two readings. Thanks Rui, actually I have tried to do exactly what you mentioned above: create 2 topics with 2 statements but get some errors. As you said we cannot install MQTT on ESP32, so do we have any way ESP32 can work with MQTT instead of installing it? If you got an error, can you post the exact error message? I might be able to help you out. Hi Rui, I just bought Raspberry Pi and installing Mosquitto on it. When I type auto start boot up command for mosquitto ( pi@raspberry:~ $ sudo systemctl enable mosquitto.service). There is an error showed: “mosquitto.service is not a native service, redirecting to systemd-sysv-install. Executing: /lib/systemd/systemd-sysv-install enable mosquitto“. Do you have any solution for this, if not what is the command for booting up mosquitto service when I power up Raspberry again? Thank you! Which Raspbian OS version are you using? What happened after running these installation commands? Did it prompt an error message? Or did Mosquitto MQTT broker installed successfully? Are you using that version? Does mosquitto start properly? What does it print? Basically, turn off your Pi and power it again. Then, run/open Mosquitto and let me know what you see in the Terminal window. Did you added the ssh file to your microSD card? Sr I was busy with my assignment. The problem is the SSH file will disappear after I copy it into my SD card. Every time I cannot find IP address for my Pi board, I take a look at the SD card and can’t see SSH file. Do you have this problem before? Why is SSH file not stay in SD card? Thank you! 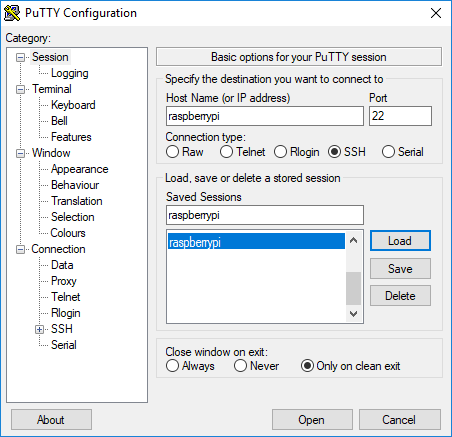 Is your Raspberry Pi connected to your router? Does your Raspberry Pi have an Ethernet connection with your router? The file usually disappears, but it enabled the SSH option. Then, click open. Does it work? If you continue to have problems, I recommend re-flashing the Raspbian OS from beginning to your microSD card, because you probably already removed the Pi from the power source multiple times. That often corrupts the operating system.